If you've had your fill of marketing theories, and you want tangible examples of successful marketing practices in real-world circumstances, then this webinar is for you. John Jordan, Executive Director of Digital Marketing for The Global Leadership Summit (GLS), and 30 of his colleagues conducted a custom, on-site value proposition workshop with a MECLABS facilitator to improve marketing performance for the largest leadership event in the world. 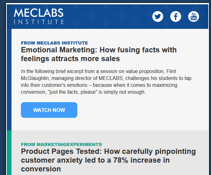 After applying the new value proposition, in addition to principles learned from MECLABS methodology, attendance for the GLS grew to 400,000, and revenue attributed to email testing increased 82%. These results motivated the organization to no longer rely on best practices or "The Golden Gut," but instead, to become a testing culture that builds a robust customer theory. Daniel Burstein, Senior Director of Content for MECLABS, hosts this session and acted as guide through the MECLABS Conversion Heuristic. Get the annotated transcription, key details and takeaways are highlighted for easy reading. View the full webinar replay to see visual examples of The Global Leadership Summit’s transformation. Get the audio file for on-the-go learning on your mobile device. This 22-page guide will give you the tactical tools and detailed examples to optimize your campaigns along with a process to support your experimentation. 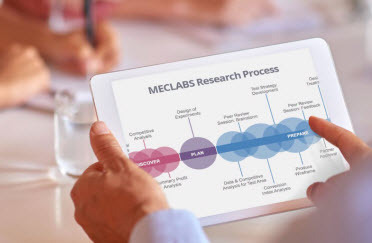 Work with MECLABS Institute scientists to make new discoveries and drive significant increases across your funnel. We want to better understand a customer so that we can better serve a customer. Dan: Hello and welcome to a MECLABS webinar. Thank you for joining us today. We're going to be talking about customer-first marketing with this great case study with The Global Leadership Summit, when they created an optimization testing culture and grew attendance by 16% to 400,000. Now, that’s some huge numbers, and this is a great case study. You might be tuning in and saying, “Hey, customer-first marketing? Well, I’m a B2B. I don't think of my customers the same way,” or “I'm a different type of company.” Well, this is a great look overall at how to create a testing and optimization culture, no matter who your customer is, to better serve them and get that increase in results. And create a more fun and better place to work for your marketing team. But it's also specifically very, very good if you are a nonprofit or if you want to advance yourself, because we're going to learn some specific lessons too for those groups from this case study. But let me start with a big take at what we talk about when we talk about changing that testing and optimization culture, what type of impact that can have. So what you see here is some data, and this is the in-conference incentive email results, which means that during this giant conference that Global Leadership Summit has, they send out an email, and they try to get people to register for next year's conference. They’re selling it one year in advance. And as you can see from 2016 to 2017 there was a 68% drop in registrations. And so the first thing we ask is, “Why? Why was there such a big drop in registrations?” And the reason was because they took out the incentive. So it makes sense. We all know if you have an incentive, more people are going to act, so it makes sense that drop there. But then we take a look at the next year 2017 to 2018 — 933% increase in registrations. A huge boost. We all love that. We ask “Why?” Well, they added an incentive. So it makes sense; you add an incentive, you know, there's a better result there. But here's the big question, “What happened here?” 2016 there was an incentive, 2018 there was an incentive. Why, it’s almost four times as much. Look at that. You know, roughly 5,000 versus 20,000. What happened there? This goes far beyond simply saying, “Hey, let's throw an incentive on it.” It’s level one thinking, the basic thinking, “Hey, let’s put an incentive on there.” But the bigger thinking, the level two thinking, that's partly what we're going to get into today, what happened there? And what happened there was an amazing change in culture, amazing change in approach to marketing, to messaging, to everything the organization did, and that's something you can learn from today to create your own incredible chart like this so you can one day present to your boss, to your client, to your board of directors this huge growth and say, “What happened here? Well, let me show you, and let me tell you about it.” … I love this great quote from Albert Einstein, right? So, hey, if we're experienced marketers we kind of know what we should do. We might have our year planned out every year. We do the same thing. We know that we write emails to send, especially if you're running an event. You know, six months out you have to do something, four months out you have to do something. Well, as Albert Einstein says, it’s kind of insanity “doing the same thing over and over again and expecting different results.” If you want radically improved results, you need sometimes to take a radically different approach to things. And when you do, you get some pretty impressive impacts. We're going to get deeper into this at the end, but just some basic looks at the impact from testing from this team. 2017 was our first full year of testing. They grew the audience to 400,000 as we said, a 60% increase, an 82% increase in revenue directly attributed to email testing. That's a huge increase from email testing. … Let me introduce the man that led this effort, John Jordan, the Executive Director of Digital Marketing at Global Leadership Summit. Thank you for joining us today, John. Dan: Before we dive into this story, I think it helps to get an understanding of who you are, who your team is and what your relationship is there at The Global Leadership Summit. Dan: I had the privilege to lead an awesome team with Willow Creek Association who puts on The Global Leadership Summit, and for us — every organization defines digital marketing a little bit different — for us, that was email, websites, social media, podcasts, apps, things like that. That was our team. We have a marketing team of about 10 to 12 people, and people from all different disciplines, email marketers, you know. Web development, for example, fell with our technology team. But these were the sorts of tools that we had to work with, as you mentioned before, to try and grow our event registrations year over year. Dan: That's great. We're going to dive into that whole digital gamut today, but give us a better understanding so the audience can understand about Willow Creek Association and The Global Leadership Summit. Because we almost have a very interesting two case studies in one today, we have a nonprofit and we have an event, so it can apply to a lot of people. John: Yeah, so Willow Creek Association is a nonprofit, and the mission of the organization is to help people across the world grow and develop in their leadership so that they can lead their teams better, their families better, their kids' soccer teams better, wherever they lead, helping them do that better. The Global Leadership Summit is a two-day event with 12 to 14 different speakers, and the purpose of the event is to give people fresh, actionable leadership content to help them get better in two days. Dan: Well, I believe it’s the world's largest event of its kind, right? John: Correct. So, this year 400,000 people will be attending the event, and that is 125 countries, as you can see there, 59 or 60 languages now. So it is by far the world's largest leadership event. John: I think a year and a half, two years ago, when we first started the process of becoming a testing and optimization organization, one of the big learnings for us was getting more people involved and getting some of those small wins. Testing did start in just our marketing department. It then expanded to include the customer service team, the executive team, the folks handling donations. So we just started including more people and started proving the concept of the power of the testing culture with just building and growing confidence by getting small wins. It could be sharing the results of an email test or a landing page test, and over time, confidence built and more people were signing off on the power of testing. Dan: That's great. You know, we see that a lot too. You know the great thing, Marc, about testing, about having a testing culture, if you’re trying to move in that direction, is there are some pretty clear results — as you'll see in today's presentation. You know, it's not like, “I think this design might work better. I think this copy might work better. I think we should try PR,” whatever it might be. But when you start actually running this test, and you see the difference, you see the ROI, it's great to evangelize in your organization and get it moving. Yeah, we want people to sign off once and only once, but kind of as John was talking about — cultural change can sometimes happen slow; and it's a slow burn, but then it burns into a very big fire. So keep that in mind as well. Start that testing. Start small. Show those wins. Share them around, and you'll get bigger and bigger buy off year after year. And also, Marc, in the third part of this webinar, we get deeper into some of those learnings that John had around that cultural change and the impact it had. But let's get into this, you know. So if you're on the call today, here are some of the challenges you might have. You might think, “Hey, how do I generate more traffic, right? How do I sell more products and services? How do I write compelling content, keep my current subscribers, right?” And so what I would ask you is you have to look up from those very base challenges, right? The challenge isn't really how do I sale more products to subscribers? That's the result you're going for. The challenge is really — what about your value proposition? What is your value proposition? Because once you get that right, then these challenges start to fall left and right. When you have the right value proposition in place, you're going to be getting more leads, you’re going be getting more subscribers. Now, of course, you need the basic infrastructure in place, that email platform, marketing platform, lead form, whatever that is. But think not just about those base challenges you face today like, “How do I get that number?” Think, “What is the really challenge behind it? Why am I having that challenge?” And often that leads to getting your value proposition right. So what were your challenges, John? Do you see them on this slide? John: So our challenge was pacing with growth, you know. The executive team, whomever, will say, “Hey, things are growing, attendance is growing well, revenue’s growing well. But we're going to put this big, hairy, audacious goal in front of you, and we need to come up with new ideas to help us get there.” … So you had that Albert Einstein quote from before. Doing more of the same wasn't helping us grow fast enough. So looking at your bullet points here, I think proving an increasing ROI and event attendees fast enough was a big challenge we were facing. Dan: Well, let’s have and some other quotes then, specifically about value proposition and this idea of customer-first marketing, because that is also how you get to those big, hairy, audacious goals — that big growth. Because when you think of it, if that's your goal, you probably have already got the customers that are most obviously your right customers, the customers that you can most obviously serve. You've already probably got those, and the question is, “How do I get bigger, and how do I grow beyond that?” And this is just that. This is from the, as we talked about, the UF MECLABS Institute graduate certificate program, one of the things we do where we share our methodology. (Something both John and I are actually students in.) And so let's take a step back into history. We see Claude Hopkins, how he talks about people, they’re … selfish, they want things, what is in it for them? That's what they want to know, right? Seems a little obvious; it's like something we know, but, again when we're too focused on those specific challenges and pain points we have, like getting more email clickthrough, sometimes we’re focused on our goals. We forget, “Well, what are their goals? How can I help address them?” David Ogilvy talks about a basic, six-selling proposition. We talk about how that leads to a value proposition, and that’s 75% of the battle. So again, getting that core essence, that core element, that value proposition of your offering and your product is so important before you even start to put pen to paper, so to speak, and start writing an email subject line or a landing page headline. And how do we do this? Peter Drucker, many years ago, talked about knowing and understanding the customer so well, the product or service fits them and sells itself, right? And that's what we're trying to do through testing. That's the whole point, to test and learn, discover that value proposition and then offer it up. So let's get into that first step of discovering your value proposition. It kind of gets into the question of, “What is a value proposition?” If you have followed MECLABS or MarketingExperiments, MarketingSherpa, I’m sure you've seen this a lot. We have a lot of content related to this. But I just want to say that at a very high level, think of it this way: You want to address the question, “If I am your ideal prospect why should I buy from you rather than your competitors,” right? And the answer to that question, you also have to understand, is you're trying to affect the perception of the customer, the perceived value, right? So your product, your service, whatever it is, your event, it might have tons and tons of intrinsic value in it. But if that's hidden from the customer, and they don't perceive it, if they don't perceive it through the way you answer this question and in the way you roll that out into your marketing, out into your messaging, and now into every touch point you have with that customer, then very likely that perceived value will be lower than the perceived cost. And if the perceived value is lower than the perceived cost, people aren’t going to act, right? What's in it for me? All I see is cost. I don’t see the value. So keep that in mind. When you're answering that question, it's not just the intrinsic value you offer, it’s how do you take that intrinsic value? How do you take that real value that's there, break down those walls and make it evident to the customer in a way that they actually perceive it? Now, this can be very challenging, right? You've been working on your brand, your product, for many hours every week, many weeks every year, many years. Sometimes, it's hard to see through the customer's eyes because you understand and you know the value of that product so well. You live it, you breathe it every day. So sometimes it helps to step back, bring some key stakeholders together and do what we call a value proposition workshop. As I understand it, John, this is something that you guys started with, right? You started with a value proposition workshop; so take us through it. What is a value proposition workshop? How did you get it organized? Who was there? What did you learn from it? John: We had a group of people before we even kicked off testing. We had to define, “Hey, why is The Global Leadership Summit valuable? Why would somebody considering coming to the event even want to show up? What makes the event appealing? What's unique to the event?” So we invited in about 30 people from all different departments of the organization and wrestled with this question. And we listed out all the customer benefits we think the Summit provides, and all the things we think are most appealing and most exclusive. What was so helpful was having, kind of, a referee in the room. So not only was it the 30 people from the organization, but a facilitator. In this instance, it was somebody from MECLABS who was able to guide the conversation and prevent against, for example, an executive, or somebody with just a powerful voice that people tend to be influenced by, overpowering the room. So having that moderator was super, super, helpful in the value proposition workshop. Dan: … Obviously, smart folks were working on this for a long time. You had certain probably preconceived notions about the value, about the product. Walking out, for you and your team, what was the biggest surprise that you took away from the value proposition workshop? Dan: That's great. We're going to see how John rolled that learning out into landing page and email in just a moment. But first, I want to make sure you understand the four levels of value proposition. Again, I’m going to go it over pretty quickly because if you’ve followed MECLABS or MarketingSherpa for any amount of time, you've probably seen this. But when we talk about value proposition and what you think about value proposition, it is probably the primary value proposition for the company; it's that core value proposition for the entire company. And you might think, “I'm not the CEO, maybe I’m not the CMO. I can’t affect that primary value proposition; how can this affect me?” Well, even if you can’t, I guarantee there's a value proposition you're affecting every day. It could be at the prospect level. So understanding from that primary value proposition what is the value prop for different types of prospects. It could be at the product level. So, if you’re a product manager, for example, from that primary value proposition for that specific product, different products will have different value propositions. Or it could be at the process level. So down to, yes, even in email, a pay-per-click ad, even free content needs a value proposition. It needs perceived value so people will act. Nothing is ever free. Even if there is no monetary cost, people have to pay with their time to act, so they have to understand that value. What we're going to do now is walk through some of these different levels and how John leverages different levels. Here we see is an example of a process level value proposition. And John, you want to talk to us about this email and how you worked value into it from what you learned in the workshop? John: So coming out of the value proposition workshop, we started to apply this. Email and PPC tended to be easier areas to test in. We tried putting that value proposition up in the header, the main banner of the email. Then, like we were just talking about, communicating the value of a location near you, right in close proximity to the call-to-action button. That was a super important learning for us. In some of our email testing was reinforcing the value that somebody is going to be receiving right next to kind of the pain point, the, “Hey, you're asking me to spend more time. You're asking me to go from the email to the landing page.” And reinforcing that value at that step in the process. Dan: Excellent. So let's look at now last year, the previous year’s Summit home page. After going through the value proposition workshop, where did you see some places where you could add value? John: And now looking back at this, Dan, I just kind of cringe. I don't know if anybody else ever feels that way. I mean, even just looking at that landing page headline, we have the logo and the dates but there's no value communicated in the main banner of the landing page. Then, you see that sub-headline about the GLS. That could be confusing. What is GLS? It's not communicating any sort of a benefit. So we learned a lot in 2016, but there was tons of room for improvement. Dan: And I want to pick out that headline for just a moment, and not to pick on you, John, you’re so gracious here. But I think that headline is a perfect example of that company logic. Like I said, this is the benefit of a value proposition workshop, of testing, of stepping outside of what you do every day, and learning from your customers and trying to think in their shoes, because I'm sure GLS makes a whole lot of sense in Global Leadership Summit. I'm sure in all of your emails and your Skype conversations and your text messages, you guys are using GLS all the time, and you obviously know you’re talking about The Global Leadership Summit. It may seem obvious to a group working in The Global Leadership Summit every day, but someone new to the page and they see that, they have no idea what a GLS is, you know. They don’t instantly make that connection to Global Leadership Summit. It’s a great example of how you can talk in your customers’ language. And you have to walk them through from not knowing about your product, certainly not knowing about it as well as you do, to then finding value and understanding and wanting to learn about your product. Well, let's go down a little deeper onto the page. You were talking about how you learned that location was so important. How were you using the host sites before on the page? John: In 2016, part of what we found was one of the key benefits of attending in a local area. We buried it in the FAQ section. It was at the very bottom of the page beneath a subsection of the FAQ. Dan: And looking now at the bottom of the page, the calls-to-action. Also, the speakers would seem to be a very important value for an event, to actually see the speakers. How were you doing them? John: They were buried on a page. You know, we tested (and this was something that we learned): 1)We’re either going to promote a couple of speakers or 2) we're going to show the collection of the speakers. But as you can see here, they were hidden on the page. And we had a lot of different calls-to-action on the page as well: signing up for a newsletter, making a donation to the nonprofit, attending the event. A lot of stuff is going on in this landing page. Dan: And now, let’s take a look at what you changed in 2017. First of all, one thing I see here is there's a very clear headline I can call out. How did you come up with that headline? John: Coming out of the value prop workshop, these were some of the statements that we found were most appealing and most exclusive to The Global Leadership Summit. So it is clear when somebody hits the stage, “Hey, I know where I'm at.” Then there is that statement of value — what the customer is going to receive from attending The Global Leadership Summit. So, yeah, right there up in the headline, then reinforced further down the page. And trying to build a little bit of credibility by saying, “Hey, join 400,000 of your peers” (being specific in that headline, you know, to try to increase the appeal of the event). Dan: I now see Sheryl Sandberg, I see Marcus Lemonis, I see lots of names I've heard of. How did you come to add that there? John: The value of the collection of speakers that this particular event delivers was very powerful. One of the key learnings was, not just Sheryl Sandberg but reinforcing that brand of Facebook, or same with Marcus Buckingham or Marcus Lemonis from “The Profit.” — Leveraging not only the speaker name but the brand that they're associated with as well, to communicate more value on the landing page. Dan: And then you talked about the surprise about the location, how you guys kind of overlooked that. How did you add that into the landing page as well? John: That was an entirely new section of the landing page, and you were talking about process level value as well. Here, we were just trying to streamline the process and make it easier for somebody to find the event location nearest them. So here is value specifically related to the product of the local event, and streamlining the process for somebody going from the email to the landing page and eventually to register. Dan: Excellent. And boom, we see the results here, more than doubled the conversions, 136% increase. That's extremely powerful … I'm a student in our UF program here. You're a student as well. Was there anything you learned in the UF program that you applied to that landing page we just saw? John: So this was part of the organizational, cultural transformation and just being good students of what we're trying to put into practice. The very first class in the program was Landing Page Optimization. We were able to take what we learned from class, put it into a real-world testing scenario, and see the results that you just showed on the previous slide, Dan. That was directly coming out of the UF Program, and, you know, I couldn't say enough great things about it. It's been one of the most actionable parts of my education. Dan: I’m glad to hear that, John. And if you're interested in a graduate certificate from the University of Florida and MECLABS in Communicating Value and Web Conversion, the next semester’s application deadline is November 1st, so feel free to go to meclabs.com/uf and check that out. But let’s jump back in. So that wasn't the only value proposition workshop you did. We talked about that at the level for the event. But for the primary value proposition for the organization, tell us a little bit about what you learned from that value proposition workshop. Dan: OK. So based on us doing a similar thing, take a look year over year how things have changed. What were you doing before on the donation page? John: This was the donation page, I think, from a year or two ago. And right there in the headline, similar learning from the Summit landing page, there wasn't a ton of value being communicated in that headline and in the image behind it. If anything, “give” implies friction right off the bat. You're asking me to do something before you’ve maybe explained why there's value in me giving — so tons of room for improvement here in the control. Dan: It's almost a demand, “Give. Give.” And the abundance of options could be confusing, so this is where they could actually choose how much to give, is that what we're looking at? John: Right. So further down the page we have different options. You could give once, give a recurring gift, give different values, you know, donate. Yeah, different ways to give. And I think our hypothesis was that it was actually confusing people, and people would get paralyzed with too many options to choose from. Dan: So let’s take a look at how you added value to the page. John: In the new page up at the headline you can see, “Equip, encourage, inspire leaders worldwide with a gift.” So here's how you're going to add value — put that right into the headline. Also, we changed the CTA up in the headline to, “Make an impact. This is what your gift is going to do,” and further down the page, reflecting the impact with some specific numbers, “Here's how your gift is going to make that impact,” with, “Hey, you know $75 provides this for [somebody] who needs leadership in a third-world country,” for example. So just adding some specificity to the page to help somebody to make that decision. Dan: Now, I see another one down at the bottom there where it looks like just one clear call-to-action with that “Make an impact” button. John: Right. [We] simplified the form, and that helped the process, maybe reducing a little bit of anxiety that somebody trying to decide what to do or how much to give may have. Dan: Great. We talked about value that’s core component to addressing all those marketing challenges. But value is only one of the elements that helps you increase the probability of conversion. What you're looking at right now is a MECLABS Conversion Sequence Heuristic they talked about. MECLABS, from almost 20 years of experimentation into customer behavior, into human behavior really, has come up with some patented methodologies, and this is one of them. This is really the core one here, and we're going to walk through this in the rest of the webinar so you understand the other elements that impact conversion. So, the next thing The Global Leadership Summit did was engage in a conversion index analysis to apply this heuristic to their testing, their experimentation, to their landing pages, to their collateral. I’m not going to go through each and every point here, but we're going to go briefly, very briefly, through that last page we looked at and see how some of these different elements of the heuristic were changed to affect conversion. And now we're going to go deeper into many other tests that The Global Leadership Summit ran to help you get a better understanding of some of these elements of the Conversion Heuristic. Let's take a look at the top here. What is one way you reduced friction on the page, John? John: Simply just by making that headline image shorter. You know, we see these beautiful landing pages that have the full-screen image, and you can't see anything further down the page. We just tightened up the vertical height of that banner so that somebody knew that there was more information on the page. John: For anxiety, we just changed the default amount to the most popular amount, to give somebody a frame of reference for what they could or should give. Dan: OK. Let’s take a look at motivation. John: For motivation, we gave that goal bar. Here is collectively what we are trying to achieve. We're trying to fill the thermometer. We're trying to reach a total donation amount by the end of the year. John: For friction, just giving a little bit more clarity when we're making that ask further down the page when somebody scrolls down, just removing all those different options that you saw and just simplified it, and simplified the options that somebody could choose between. Dan: So what results did you see from this effort? John: … You see year-end giving is so important for nonprofits and people trying to maximize their year-end giving for tax purposes. You can see the improved conversion rates on the page even though there was a little bit more variation. Year over year, we saw a much higher conversion rate, 2016 versus 2015. Dan: That's very impressive. That's nice to see those bar charts go up and to the right. As I mentioned in this webinar, we’re going to go deeper now into some of the different tests that John and his team ran, and how they used the heuristic and the specific elements in the heuristic to increase conversion. But if you're more of a reader, more of a visual learner, you want something right in front of you that you can read through to help understand these methodologies and put them to work for you, you can go to meclabs.com/opt-guide. 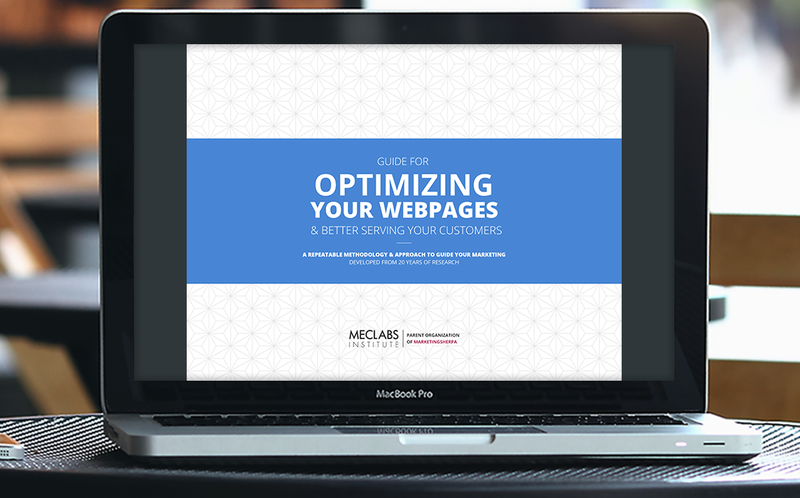 You can get the MECLABS Guide To Optimization and further apply what we're learning here with tackle tools and detailed examples to help you optimize those campaigns. But let's get back into it. Let's look at how you implemented that Conversion Heuristic into your testing. Let’s start with motivation. So motivation, as you can see here, there's different numbers applied to this MECLABS Conversion Sequence. And also, you see that equal sign. This isn’t a specific equation meant to be solved. It's not like if you figure out the perfect values for these things you can throw them in and boom! you solve the equation, and you solve all your problems. This is a heuristic. It's just a thought tool. You know, in other industries like, for example, in manufacturing, right? There are specific processes and specific systems and methodologies like total quality management, like Kaizen, like Lean manufacturing. And from that, manufacturing has become very high quality, very consistent. But marketing, over there in the marketing department, it's kind of been run just based on the golden gut. There's that one really good writer, that good marketing manager, who kind of gets it, and some other folks — they don't. And so that's why we created this conversion sequence to have a consistent methodology where anyone on your team from the most experienced marketers (they can look at the customer in a whole new way using this), to the most entry-level marketers, someone new to digital marketing. They can look at this and try to at least get an understanding in a common language and identify opportunities for improvement to, at the end of the day, get that “C” which stands for probability of conversion. If we look at these numbers, you don’t multiply. It's not the perfect way to solve the equation, but they indicate how much these different elements affect conversion. We see “3” for value proposition, which we addressed before. But a piece that actually helps with conversion even more than value proposition is motivation. And the motivation is really what’s intrinsic to that customer, right? You can't change their motivation. You can simply do a better job of tapping into it. One of the ways that Global Leadership Summit wanted to learn about the motivation of its customers was to test and understand the speakers, how big of an effect the speakers had on the audience. When you think of an event, one of the biggest investments, one of the biggest public-facing elements of an event, is the speaker. So that's an important understanding to have. Let's take a look at the speaker order email test. John, tell us what you were doing here. John: We were testing why people want to come to the event, who do they want to see. We broke out this test by the control. You can see there on the left. This was the group of speakers that we thought were the buzz names, right? We were testing here if men and women are motivated differently to see different people at the event. You know, in a lot of events, you have buzz speakers. You have thought leaders. You have some people who are more scholarly or some people who have more of a business bent, for example. So we were content testing the order of the display of the different faculty members. You can see the three variations there between the control and the two treatments. Dan: And what did you learn? John: Even though there was not a huge difference in the number of conversions, we found that the business faculty being listed first did tend to resonate better with men, but it drove the lowest amount of conversions between women, which just suggested we need to do more research. We need to keep going to school on this because we did not have a strong difference in how people were motivated between these different groups of speakers. We just said we need to keep researching and learning more about this. But we did see a slight variation between how men and women reacted. Dan: And, you know, you're going to see a lot of big lifts later in this webinar, but sometimes, having no relative difference is an important thing too, because you'll learn that “hey, something we thought was really impactful, it's not. And we need now to shift and focus on something else,” or like John said, “learn about it in a new way.” So, if you're starting to test and getting things like no relative difference, and you're feeling bad about it, you’ve got to look beyond just the individual result you get from that experiment, and say, “What are we learning about the customer? Let’s build our customer theory. Let’s learn more and more about the customer so we can test more.” And then ultimately, that's where some of those big lifts come. So let's now move on to friction. You see friction has a minus sign in front it. That's because there are some positive elements (like we saw earlier in that scale we showed you) that add value, that drive people towards conversion. And then there are some negative elements that are costs, right? They’re not just monetary costs, but actually things that people look at as costs in time, costs in just because it scares them or something like that, and they hinder conversion. And friction is one of those elements, right? It is a psychological resistance to something in the conversion process. It’s something that is difficult to get through, and you can never minimize, or you can never totally eliminate it. You can only minimize it, right? Because obviously, there is inherent friction anytime you're asking someone to make a conversion. But one of the elements that Global Leadership Summit tested, as we get back to that learning about location, is geo-targeting in that email, because with geo-targeting they could reduce friction. … Let's take a look at the control here, John. What were you doing before? John: Before, we were just saying in the email on the left, “Register now for a location near you.” And we did not help them understand where the nearest location may be. In the treatment, we used some variable data based on what we knew, either by their IP address or based on their past registration history, and just said, “Hey, here is one option for a host site nearest you, and we're going to take you from the email. We're going to skip that landing page there you can see in the middle where you have to find your location. We're going to take you directly to register for that site nearest you.” So, we were essentially cutting out a full page in the process of registering for The Global Leadership Summit. Dan: And what were the results? John: This was a great test. We saw an 87% increase in clickthrough in the email just by being a little bit more specific and relevant, saying, “We think we know a little bit about you and where your nearest host site may be.” So, we saw a great lift here in terms of email clickthrough. Dan: And what did you learn about the customer? John: This is the longer-term thinking that we needed to adjust to as we became more of a testing organization — it is not the short-term win. We started to compile some of these customer insights. What we learned here about the customer is that by showing them how easy it is to attend an event nearest them, we could influence more registrations. And personalizing the email just gave customers a reason to engage and eventually sign up for the Summit. Dan: When you’re looking to test friction, one of the great things John's team did here was, hey, if something's closer to them, there's lower friction, right? That's obvious. But another thing, it's not only the messaging on the page, the messaging on the email, they looked at that process and they said, “Let's just entirely remove this page. Let’s just entirely remove this step.” So it's not only looking at what messaging you put up, it’s thinking about what are you making your customers go through. And if you can remove a step or two, if you don't need them, test it. Try it out. Make it easier for that customer. So you also applied this lesson to the landing page. How were you geo-targeting on the landing page? John: Based on this developing customer theory, people like knowing — like you just said, Dan, reducing some of the friction — knowing that they don't have to travel as far to attend an event, we decided to feature that more prominently on the landing page. So you see it there in the headline, “Attend at a location near you.” We added the location finder to the first step of the registration process there on the landing page. Further down the page you can see, hey, maybe we're not putting things in the right order on the landing page. Maybe people need to find out a little bit more about the event before we ask them to find the site nearest them. Dan: And this last point is interesting. It actually gets into the functionality of the page itself. John: Yeah, especially if you think about how do some of these elements work on mobile, interactive maps and things that we think may be making it easier for people, may actually [be making it] more difficult. So, another learning for myself and the team. But as you can see on the next slide, we did try to simplify that in the treatment. Here, we just clipped a search bar right in the main header where somebody could type in their city, ZIP code, state, and that top section of the page we just updated. We moved that map from further down the page to a little bit higher on the page and added that Map Plus search-field functionality. Reinforcing right by that point of friction or anxiety with the call-to-action button, we reinforced the value in close proximity to the CTA button of attending at a site near them. Dan: Now, let me ask you, John. How many people on your team (when you actually have The Global Leadership Summit) are actually at The Global Leadership Summit onsite, and how many of them go to one of these remote host sites to attend the event? John: So about 6% of the total attendants are live in the room just outside of Chicago. The other 94% to 95% of people are attending at a host site in their own local community. Dan: And for your team specifically, like your marketing team, are you live at the event, or are you remote at the host sites when you actually attend the event yourselves as attendees? John: For the marketing team, you know, almost everybody is at the live event in Chicago. And that was just some of the danger of that company-first thinking where we weren’t maybe necessarily putting ourselves in the shoe of the customer as we should have been, thinking about their experience at the local site. Dan: Yeah, that's why I bring it up, John. I think we’re on the same page now. I think it's just a great lesson for everyone that's listening today is, hey, how are you experiencing your product and how are you experiencing your service? Are you experiencing it like the customers are actually experiencing it? Because if you're not, then, again, you can have some of these blind spots where you're so excited to attend that live event, that's what you're thinking about every day when really, 94% of your customers aren’t experiencing it the same way. So think about how you experience your own products too. Let's take a look at the results, John. John: We did see an increase in the overall clickthrough rate from the landing page into the registration funnel. So, we were initially excited in that 32% relative increase in clickthrough rate. Dan: So what happened further up the funnel? John: You can probably hear a little bit of the hesitation in my voice. That excitement quickly waned because, unfortunately, we didn't see a big lift in conversion rate. However, the learning for us was, “hey, we moved more people from the landing page into the registration funnel. Maybe there's something that we could do in the reservation funnel to help increase that conversion rate through the process.” So as we think about pushing people up that marketing funnel, we just need to keep reinforcing that value. And we learned something earlier in the funnel that we should start applying kind of further in. Dan: That's great, and if you're listening today and you're saying the same thing, “Hey, I'm killing it on the intermediate metrics and doing really well, but later in the funnel I'm not doing as well,” it's a great indication to say, “OK, shift your testing. Move a little deeper into the funnel and see what you can improve.” All right. Let's take a look at pay-per-click advertising. Big expense here. Let's see. What were you thinking how you could optimize your pay-per-click advertising? John: So PPC advertising isn't nearly as pretty as some of the emails that we know. However, our hypothesis for this test was where do we take people after they click on the ad? So you see, you know, five ads here, we ran the same set of ads in the treatment. What we were testing is where do we land people after they click on the ad? Do we take them to the most relevant part of the landing page, or do we drop everybody on the top of the landing page? You can see the links have those page anchors on them in the treatment, and that was part of the hypothesis we we're testing. Dan: And that's another great way to remove a step in the process for the customer, and what were the results? John: We did see about 1,200 additional registrations just by being a little bit more relevant from having a little more continuity between the ad and where they landed on the landing page. Dan: And how did the test results actually work on deeper linking them to the page? John: It worked. I cannot make a blanket statement that, “This is going to work for everybody.” What we learned is it works sometimes, and that gives us a new place to start from for next year's testing. So it did increase conversion rates when we took somebody from the ad to the speaker part of the landing page. Dan: That's great. And you see a lot of data on the chart. We want to break it out because that was one learning, but John [and the team] had a few more learnings from this experiment. What was something else you learned, John? John: I can't blame anybody but myself on this one. We thought we were being smart by using the Google optimization feature. Google Ads will offer to run the best ads that are increasing your conversions best. However, we did not hit a great level of confidence on a lot of our different ad groups because we didn't get good enough sample sizes. So that was just a learning in our testing methodology that we would change and apply moving forward. Dan: And if you're unfamiliar with that term and you're doing some testing and you’re listening today, the level of confidence is important because you want to make sure that you're testing with enough people so that what you're seeing is a representation of the actual results that would happen. If you test with too small of people you might just see random chance. So, for example, if you flip a quarter twice and it lands on heads twice, it doesn't mean there's heads on both sides, right, you know? If you flip it 100 times or 1,000 times, you're more likely to get that 50-50 split, and it's the same with your experimentation. If you really want to learn from your test, you want to make sure you have a high level of confidence, make sure you have statistical validity — that you're experimenting with enough people — that what you see is actually a representation of what would happen if you rolled this test out to your full audience. John, I think you also learned something about the messaging itself between the different types of ads you ran on Google. John: So the big learning here, and you can kind of see this with the green boxes, was adding urgency and countdown timers to the ads was very effective in terms of getting people over the hump from clicking on the ad and moving through the registration process, just having that kind of dynamic piece of urgency: “Hey, only five days left, only four days left for you to receive best rates from The Global Leadership Summit,” for example. Dan: And that's maybe a function of Google pay-per-click ads that people are overlooking, the fact that you can have a countdown timer in there. Let’s talk about anxiety. That's also another negative element. That's something that can keep someone from wanting to convert.. You know, it's not always rational consideration the way our minds work. It's some sort of a psychological consideration that’s stimulated in some way that gives them a degree of risk, a degree of, you know, being scared to take that action. And so, let's take a look at how The Global Leadership Summit tried to reduce some anxiety. What were you adding into your emails here, John? John: So, testimonials. We just thought, “What are the specific points of anxiety that our customers might be having that we need to overcome with a testimonial or two in the different email treatments? Dan: It’s a great example of what we call social proof, and what were the results? John: We did see an almost 11% relative difference in the number of people who not only clicked through, but actually registered for the event. Dan: Great. So we took you through a lot of different tests, a lot of different types of digital platforms, email, landing pages, pay-per-click ads and all of these things, and hopefully, you got some individual good ideas there on how to improve your process, remove a step, improve a headline, change a button, whatever these things are, but here is the big takeaway: If you just take that away from the webinar, I worry we're selling you short because the big takeaway is to look at all of this in an entirely new way. You have to use these results to really change the culture within your organization. So we’re going to take a look at one last step in the heuristic and that is an incentive. And I talk about incentive with caution because I think this is overused and abused in the marketing world. I like to call it the bacon of marketing tactics because if you're a bad cook, here's a quick cooking tip. You have a kale salad, plain kale salad, just throw bacon in it. It’ll make anything taste better. And people tend to do that with their marketing too. They just try to throw incentives on top. Like back, you know, 10 years ago, GM and American car companies, they were actually paying you to buy their cars, $4,000, $5,000, $6,000, just buy our cars. Well, as I'm sure you’re not surprised, it is not a way to sustainable marketing success. We’re about to look at an incentive test from The Global Leadership Summit, but I mention it along with the testing culture because this is what we showed you in the beginning of the webinar. We showed you this chart. We showed you these big differences. So tell us, John, first, what was the change from 2016 to 2017? John: So from 2016 to 2017 we removed the incentives. Many conferences will say, “If you register before the conference is over or shortly thereafter, you're going to receive a pricing discount.” In 2016 we said, “Yes, you're going to get the best price. You're also going to get the audio from the conference, which is valued at $49.” In 2017, we removed the additional incentive of the audio and just offered the lower price. Dan: So then in 2018? John: 2018, we added a new incentive which was valued at $99 of, “Hey, watch the videos from the event immediately after the fact,” and you can see the huge jump in registrations as a result. Dan: I mean, you can't look at this chart without thinking the same thing I thought, “What the heck happened here? (I specifically asked her to put those words on that site) What is going on?” I mean, to anyone looking at this chart we would want the same thing to happen. Sure, not that drop in 2017, but that huge increase in 2018. So John, we’re about to look at the specifics about this in-conference incentive email because we do want to talk about incentive. We do want people to understand how to use it to improve things. But the bigger picture, stepping back, what changed in your organization over those two years that you could identify, a small change you could make to your in-conference emails to create such outsized results? Dan: And that's vitally important what you just said because incentives cost money, right? Incentives, they're either going to hurt our margin or they're going to have a net cost on us. So let's take a closer look at what you actually did here, what your team did. John: We saw the graph on the previous chart, but we had a little over 20,000 people registered for the event as a result of … the incentive: “Hey, get our best pricing and get videos from this year's event right away. We value it at $99.” So what we learned as a team is we need to keep the urgency in our incentives up. It can't just be this open-ended incentive: “Hey, get $49 off,” or “Get these videos.” There had to be a cut-off time that got people moving. Then we learned, “How can we increase the perceived value?” So going from the $49 incentive to the $99 incentive helped us do that. One big learning for the team is if you're doing an incentive that you think might go really well, and this one honestly just exceeded our expectations a little bit, make sure that your systems are prepared to handle that volume. That was a key learning for the team. Dan: So it's good when you break the internet, but it's also kind of not good when you break the internet, right, because you’ll lose some stuff. So that was important. I know we talked a lot about messaging and value proposition and some of those core copy and design elements, and product creation elements. … process and technology are important when running tests because some organizations struggle just to get tests up. And as we look at your testing timeline here, we have 86 slides here. I hope you can see we got through a lot in the 60 minutes time we had to get in. We’ve just scratched the surface. Look at all these other tests that John’s team ran. So, from a fundamental level of technology and process, what else can you teach us there for other people who are trying to test more? John: I think we, as a team and with some guidance, just prioritized the tests in terms of overall impact that we thought they would make. So in the front end of the calendar year, we tried to test the areas where we thought with a Summit landing page, with some of these emails, we can move the needle faster and farther. Let's get some of those learnings on the front end of our testing so that we can apply those learnings later on. For example, we may have learned something from the landing page test in January that we can then apply in June or July. So just as we look at all of these tests, we needed to prioritize where we thought we were going to make the biggest impact, and tried to put that on the front end. Dan: OK. Great. So let's take a look at that. Now, the big picture after everything we just saw. I touched on this in the beginning, the impact from testing. But John, let's hear it in your words. John: So really transitioning the team from learning about testing and optimization, going through programs like UF, we mentioned before, Dan, to now putting those things in practice, and even walking through the hallways of the organization and rather than hearing somebody say, “I think we should do this because it's a best practice,” to now saying, “Hmm. That's an interesting idea. Why don't we test that?” That was a huge cultural transformation for the organization. We are on pace. You can see it there: 400,000 people will be in attendance at least this year for The Global Leadership Summit, and a significant impact specifically in email. And I want to give the entire team who made those email testing possible a lot of credit. That was really amazing results. Dan: And I noticed there are 128 countries, 60 languages. When I was looking on Twitter earlier, I saw there's even a GLS for Rwanda account. So what we're talking about here, how universal is it? What did you learn was different between different cultures in different countries? John: We took what we learned from our value proposition day here in the United States, and we started to do that around the world, whether it was in London or Tokyo, and just walking through the same framework. And what we realized is that the things that we value here in the United States were not necessarily the same reasons that somebody attends the GLS in Japan or wherever. Dan: … Essentially we're talking about customer-first marketing, how to put our customers first to better succeed in our marketing, and using a customer-first science approach to do that. So we saw some great things obviously. We saw those results. We saw those lifts. We saw more ticket sales. We saw more donations. As marketers, whether we were working for a nonprofit, whether we were working for B2B, working for B2C, obviously we want those bottom line results. But at the end of the day, what we also want to do is better understand the customer so we can better serve a customer. So how did that work for your team? What did you learn about customers in general, and what did you learn about your specific customers? John: We learned not to be shortsighted, not to get too excited or disappointed if an email or a PPC ad or handwritten letter campaign, if any of these short campaigns, had wins or losses. We tried to keep our eyes on the long game and on developing some of these customer insights. So now we have two years of this developing customer theory that we can apply as we go into our marketing for the 2018 event, and that is the real win. Dan: And John, I asked you in the beginning when you did a value prop workshop about the biggest surprise that came out of that. You know, after this kind of journey of trying to test your customers, put yourself in the customer's shoes and learn from those customers to better serve them, what are the some of the biggest insights, biggest surprises that you had about your customers? John: I'm reminded of Marc's question from Twitter, actually from the beginning of the presentation, about the cultural transformation. That is the biggest surprise to me looking back. Originally, I thought this was going to be a marketing initiative. Doing some of this optimization, it has become kind of a part of the organization. And that has been one of the biggest surprises — hearing people use the word like hypothesis and testing and control and treatment as an approach to what we do as an organization, rather than it just being something that the marketing team does. Dan: If what you saw here today — if you like it as well, if you like to be like John, if you like to transform your organization by fostering a testing and optimization culture — when you leave today's webinar (because we’re wrapping up right now), there's going to be a survey at the end. You can say, “Hey, I'd like to know more about Research Partnership opportunities or some of these other opportunities here,” so you can also learn more about the customer and improve. But one last question we have before I let you go, John. We’ve got a question here from Marc. He says, “Is there a little list of all the targeted channels used to promote the event?” Can you give us just a quick insight into that? John: I think some of the key drivers were email, PPC, some landing page testing and then incentives [that were] not in terms of dollar giveaways or physical tangible giveaways, but giving some free resources to begin that customer relationship, whether it's downloading white papers or different resources. That really helped us build a quality that we were able to start marketing The Global Leadership Summit too. So, in terms of the digital channels, those were some of the key drivers, in addition to some of the offline media like brochures and videos that some of the local organizations were planning. Dan: OK. Great. Well, we're at the end here, so please fill out this survey. One, tell us about this webinar, if it helped you, what else we can do to help you on your own customer-first marketing journey. And, two, let us know if you want some specific help with Research Partnership, or something like that. John, thank you for coming on, representing your team, working with us over the past month or so, putting together this presentation and sharing everything you've learned. Really appreciate your time. Dan: And thank you all for attending. We'll see you on the next MECLABS webinar.